Teen Titans #3. Will Pfeifer- Writer, Kenneth Rocafort- Artist, Dan Brown- Colorist. I will say I was pleasantly surprised with this issue. 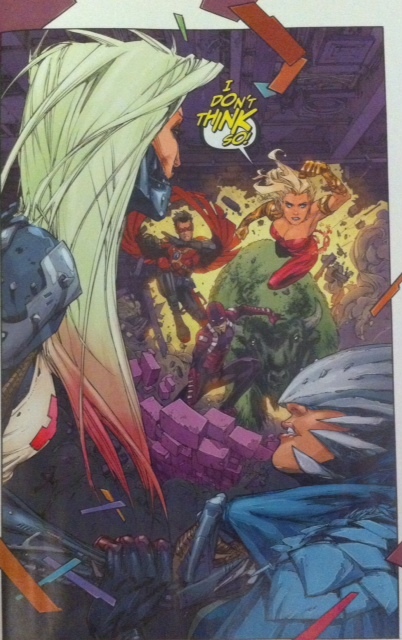 For a first time read of Teen Titans in the New 52, it was quite enjoyable. 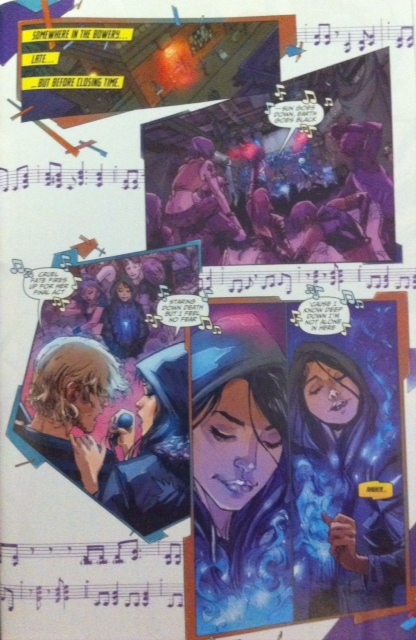 The issue opens in a bar in the Bowery where Raven is taking in a concert by a band inspired by her. The robot from the previous issue returns and attacks- attempting to do more damage. There is an interesting cult of personality surrounding Raven and Cassie in this issue each providing a new twist in super-hero worship. Ravens admirer wants to be a super-hero, but has no powers so she convinces herself that forming a band that does songs about Raven is ‘about the same thing.’ Cassie is faced with a gang of girls that dress like her and attempt to emulate her, though from her mom’s comments it seems these ‘followers’ are creating more mayhem than they are preventing. 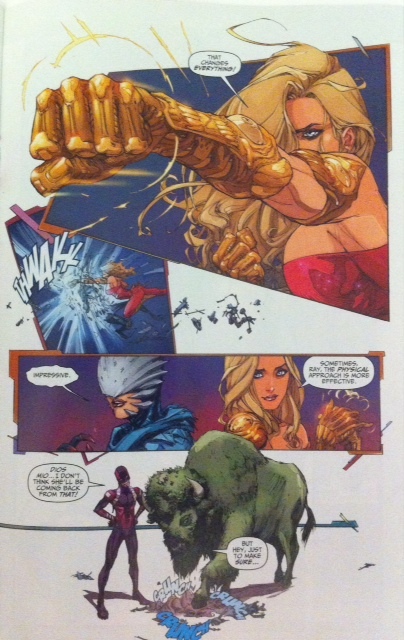 Raven calls the other Titans in to deal with the robot and it is quickly dispatched by a massive left hook courtesy of Wonder Girl. However, all is not well, as Tim secludes himself to investigate what’s actually going on- hint: S.T.A.R. Labs may not be completely forthcoming. Tim ends up in trouble with the robot (AGAIN!) while the rest of the Titans enjoy a late night snack reminiscent of the post-credits ‘Shawarma’ scene from “The Avengers” film. I found an energy and freshness in this issue that I didn’t expect. The scenes with Bunker and Beast Boy were reminiscent of the Wolfman/Perez Titans with Changeling and Cyborg. There seems to be a genuine friendship between the two which is always a selling point. Raven was extremely interesting because of the effect she seems to have on people, and while still mysterious she didn’t seem as distant as her classic portrayal. 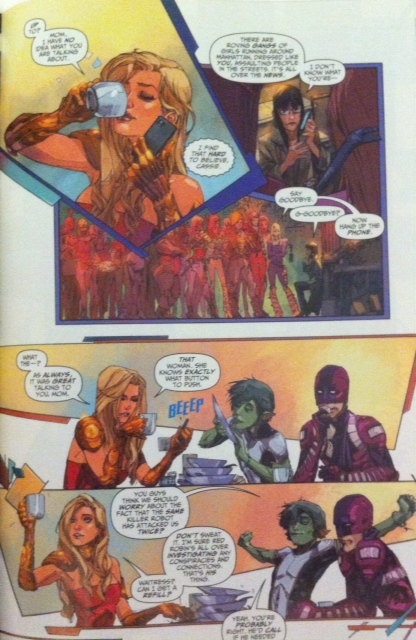 Kenneth Rocafort does a nice job of storytelling, even if his draftsmanship seems a little rushed. However, there are some panels that are particularly well-executed. I was a bit disappointed to see Tim somewhat marginalized as the natural leader of the team. Although, this again mirrors the Wolfman/Perez Titans in their first few issues as the enigmatic Raven is the prime mover- gathering the Titans to form and essentially doing her will. This book definitely feels contemporary. And despite that I liked it. It echoed things of Titans past while being completely different- and that was not what I was expecting. It’s easy enough to jump in. There’s enough allusion to what’s already transpired that the reader doesn’t feel lost. As one of the few re-launches of original New 52 titles, this book is on the right track. It’s worth your time to give it a chance.